The holiday season is every where we look and listen, sparkling lights and holiday tunes fill the air! To celebrate this holiday season, DFW Craft Shows will be hosting giveaways every Tuesday until the week of Christmas! Giveaways will start on Tuesday and end the following Monday evening at 10PM. As you are doing your holiday shopping this year, we hope you will consider our sponsors and advertisers for your indie shopping needs. This week's giveaway is sponsored by Rori of Made by Rori. Rori has been crafting for more than two decades and is lucky enough to come from a long line of strong, creative women. Providing lovable items at affordable prices is important to her. Check out these delightful notebooks she has created for catching your thoughts, lists, memories, and more! How to enter: Well folks, the holidays are here. You're almost done with that shopping list and the decorations are up. Now all that's left is the cooking... To enter the giveaway, simply leave a comment (here or on Facebook) and tell us what holiday goodies you are cooking up this week! And if you're like me--not so great in the kitchen--feel free to daydream about what you're eating instead. For a BONUS entry, share this giveaway on Facebook or Twitter (tag dfwcraftshows) and then comment below to let us know that you have done so! Please don't forget to leave an email address, if I cannot contact you then you cannot collect your prize! Contest ends at 10:00PM on Monday, December 26th, 2011. Winners will be announced Tuesday, December 27th, 2011. Entries open to the US only. Congrats to Julie of CocoandCocoa, you have WON a Large Whale Grid Notebook AND a Large Vintage School Kid's Notebook created by Made by Rori, a $20 value. This hand-stamped Large Whale Grid Moleskin Notebook measures 5 x 8.25 inches and has grid pages with a pocket inside the back cover. The Large Vintage School Kids Notebook is also a hand-stamped moleskin and measures 5 x 8.25 inches with lined pages and a pocket inside the back cover. From birds to giraffes, bikes to cars, and many designs in between, Rori has a hand-stamped notebook to fit your style. Check out Rori's website to see the many adorable designs available and pick one out for yourself! Panther City Bar Bazaar Chili Christmas Extravaganza! "It's that time again friends! This time with an ALL YOU CAN EAT CHILI twist! Panther City Bar Bazaar and Lola's Saloon Present the first Chili Christmas Extravagaza! This year we want to help you fill your stockings with handmade goodies and fill your bellies with excessive amounts of chili! Panther City Bar Bazaars are always free.... BUT, a $5 donation or some non parishable food items will get you a snazzy wristband that allows you ALL YOU CAN EAT CHILI! Until we run out that is... Somebody bring some corn beard. I like corn bread." Booths are 4ft tables for $60 and spaces will vary due to size and shape of the bar. To apply, please email Tyler at tydbowlstevens@gmail.com by December 16th, 2011. For more information, visit their website or contact their event coordinator at panthercitybarbazaar@gmail.com. This is the last weekend to hit up Arts & Crafts Shows for some completely unique, locally made goodies! DFWCraftShows has the scoop for what's going on in your neighborhood. "Come out and support the Community FFA! We have lots of activities...vendor booths, bake sale, dessert contest, chili cook-off, live music, cow patty game, lawnmower races, horseshoe tournament, raffles, and auction...COME JOIN THE FUN!!" In the spirit of supporting our local community we will be accepting toys for Toys for Tots." "It's that time again friends! This time with an ALL YOU CAN EAT CHILI twist! Panther City Bar Bazaar and Lola's Saloon Present the first Chili Christmas Extravagaza! This year we want to help you fill your stockings with handmade goodies and fill your bellies with excessive amounts of chili!" "This is the last Deep Ellum Outdoor Market of 2011! Come hang out in Deep Ellum and take care of your last minute holiday shopping!" This week's giveaway is sponsored by Crystal of Stitches-N-Stones. Stitches-N-Stones offers a variety of stylish, personalized apparel to fit your every need. Crystal creates amazing rhinestone designs (such as the fabulous shirt you see below) and adorable prints to help add that extra flair to your every day wardrobe. She also offers custom digital printing for small businesses, teams, and more! How to enter: Baby, it's cold outside. You wont catch me wandering from door to door singing any tune but "Let me in, I'm freezing!" So, how do we spread the holiday cheer? Simple! Leave a comment (here or on Facebook) and tell us your favorite holiday song. We will get a virtually chorus going right here on DFWCraftShows.com! A BONUS entry will go to anyone who shares this giveaway on Facebook or Twitter. Please tag us in your mention and then post here letting us know that you have shared to be rewarded your bonus entry! Please don't forget to leave an email address, if I cannot contact you then you cannot collect your prize! Contest ends at 10:00PM on Monday, December 19th, 2011. Winners will be announced Tuesday, December 20th, 2011. Entries open to the US only. Congrats, ongossamerwings, you have WON a Gothic Cross burnout long sleeve top by Stitches-N-Stones, a $29 value. This ladies' 50/50 poly/cotton burnout thermal top has a large gothic rhinestone cross featuring over 1000 rhinestones. You can select your top size (S-XL) and top color (white, black, dark chocolate, dark gray or plum). Stitches-N-Stones offers a variety of custom made rhinestone and printed apparel and accessories, check out their online shop to see more! I love to see SO many shows all over North Texas support their local artisans and communities! These are great places to get your shopping done and help out fellow Texans--spread the word! 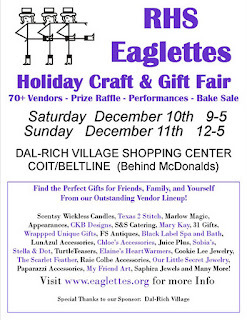 "Join the Richardson High School Eaglettes for their Holiday Craft & Gift Fair on December 10 & 11. The Fair will be held this year at Dal-Rich Village, SE corner of Coit/Beltline in Richardson. The Fair features 80 vendors from the metroplex offering shoppers the finest in jewelry, home decor and accessories, clothing, food, health and beauty items, and much more!" "Etsy817 (817ArtsAlliance LLC) presents an exciting vendor opportunity in the Downtown Arlington area! Handmade Holidays - Art, Craft & Vintage Marketplace!" "Come and Join the staff and residents of Watervue Apartments, for a night of shopping, champagne and Hor Dourve's. With 35 vendors ranging from Designer perfume, designer handbags, home decor, jewlery and SO much more. This is definitely a night to remember." "Presented by The Friends of the Grapevine Public Library, you will find something special for everyone. Artists include pottery, quilts, hand knitted items, photographs, paintings, art note cards, sterling silver and hand wrought jewelry, and graphic art. Support local artists and your local library. Come to the Grapevine Public Library December 10 from 10am - 4pm and December 11 from 2pm - 5pm." "Hand selected vendors & crafters for their excellent customer service and quality products. Please join us for a day of fun. Support local businesses and check a few people off of your gift list! Door prizes will be drawn at the end of the day." "'Buy Local, Support Small businesses, Local Charities, Artist and Your Community. " Bring 3 or more Can good items upon Entry and Receive 10% off any booth of choice. "We anticipate hosting a Bazaar of many diverse vendors, presenting a wide range of amazing merchandise. This is a last chance bazaar for Christmas shoppers. We will have pictures with Santa and many competition spectators will be attending as well. This bazaar will be heavily advertised a perfect weekend for you to display all your wonderful gifts. All proceeds from the Christmas Bazaar will benefit Bishop Lynch Brigade and JV Silver Cadettes." "Shop our vendor booths for apparel, jewelry, cosmetics, home decor, unique holiday gifts and more while enjoying holiday entertainment and food throught the day!" Admission is $5.00. Tickets can be purchased at entrance or at Longview News Journal (320 E. Methvin St.). "Come join us for a delicious breakfast with Santa and get your Christmas shopping done with many local vendors!" "Over 125 vendors from Texas and Oklahoma will be selling thousands of handcrafted items, including wood-crafts, Christmas and home decor, women and children's clothing and accessories, quilts, jewelry, candles, and many other items. This show benefits Sanger High School Business Professionals of America." "More than 100 vendors will participate in Mesquite Educational Paraprofessional Association’s (MEPA) Annual Holiday Bazaar. Proceeds from the vendor booth rentals will go toward providing 10 scholarships of $750 each for students from Mesquite ISD high schools and the Mesquite Academy." "Tons of great local vendors!" "Door prizes and many local vendors to help with your Christmas Shopping!" Booths are limited to one 6' table, provided by the vendor. The table must be covered. The cost of your space is to bring/provide one store bought snack to have out during the event. Please do not bring anything that needs refrigeration. They are only looking for two more handmade vendors for this event. Applications are available here and are due by December 8th, 2011. Please submit product photos with application. For more information, contact their event coordinator at amandashea1976@yahoo.com. This week's giveaway is sponsored by Veda Larkowski of Go Rustic. Veda just turned in her nine-to-five for a special position as a stay at home mom and indie business owner! She truly enjoys designing and creating a variety of items, from bridal to seasonal and home decor, Veda puts a personal twist on that perfect piece for your home. How to enter: Last year, we had a Wishlist Giveaway and it was so much fun to see what crafty creations our little community was craving! So, why not do it again? Simply leave a comment (here or on Facebook) and tell us one crafty item on your holiday wishlist! For a BONUS ENTRY, share this giveaway on Facebook or Twitter (tag @dfwcraftshows), OR post a link on your blog. Mention that you shared the giveaway in your comment below, and you will be eligible for one bonus entry. Please don't forget to leave an email address, if I cannot contact you then you cannot collect your prize! Contest ends at 10:00PM on Tuesday, December 13th, 2011. Winners will be announced Monday, December 12th, 2011. Contest open to US only. Congrats Jessica S.! You have won these Rustic Snowflake Christmas Gift Bags with Wood-Burned Name Tags by Go Rustic, a $26.99 value. This is a set of 6 (six) gift bags are made of heavy kraft paper with a snowflake design burned onto the bag. Each bag has a wooden gift tag that is also burned with a snowflake design. This is just one of the many, many fun choices for seasonal decor at Go Rustic, check out their website for many other items that are perfect for gift giving this holiday season! Are you interested in sponsoring one of our HOLIDAY giveaways and having your business listed on our site as shown above? Just a few openings remain, please email me at dfwcraftshows@gmail.com for more information!